I hear from both sides continually. 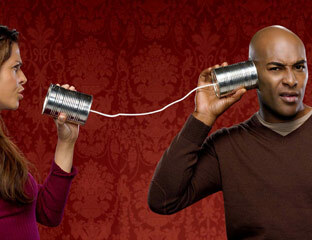 Between the two sexes, communication appears to be the biggest struggle. It’s a constant work in progress in my own marriage. The differences in men and women make communication difficult. My counseling background and years of experience working with couples has given me insight into some of the barriers men and women face when communicating. I realize not all men are alike, but there are some generalities that can perhaps help a woman better understand a man and improve communication. We don’t often like to give details – If we said where we were going, who we had a discussion with or what we had for lunch, that’s usually enough for us. We may not like going into detail beyond those simple facts. I understand you may need and even deserve more information, especially when a man hasn’t proven trustworthy, but know its often out of our realm of comfort to provide it. When it’s not a matter of trust, the less you pump for details the more likely we’ll be to share facts, and even occasionally, details. Our range of emotions are limited – Most men don’t feel as deeply or multi-faceted as a woman feels about an issue. It’s not that we don’t care. It’s just that we are wired differently. If you ask us how we feel, “happy” or “sad” may be as descriptive as we can get. Because of this, men tend to communicate more factually and less emotionally. When you may tend to cry we may tend to get angry – There is never an excuse to misuse anger and abuse of any kind should not be tolerated, but anger in itself is not a sin. The Bible says “in your anger do not sin”, but it seems to assume we will have moments of anger. The same things that cause most girl’s emotions to produce tears, often cause a man to develop testosterone-producing anger. A godly man learns to handle that anger responsibly, but it doesn’t eliminate the response. When an issue riles a man emotionally, it helps if you understand his emotions may be normal and you may even be able to help him channel his response to that emotion. Cheryl does that for me continually. Sometimes we have a hard time communicating what’s on our heart…often we never do – This is sad and we may even know it. The more you make us feel we’ll be respected regardless of the situation or the emotions we display, the more likely you’ll see our true emotions. You can actually help us with this one! Please understand. I’m not making excuses for men. The basic premise of all of these is to remember that men and women are different. I’m simply trying to help you communicate with a man. Wives, any tips on how we could better understand you? I’ve learned a few and could share them, but thought it may come better from you .